Baseball fans know the stories of superstars like Ted Williams and Bob Feller who lost some valuable years of baseball during World War II. But one pitcher actually gained from those years in the service. Before being drafted into the U.S. Army in 1942, Vern Bickford scuffled for the Class D Welch Miners in the Mountain State League. He returned to baseball three years later after receiving sage advice from a host of major leaguers. “If it wasn’t for the war, I’d still be pitching in Welch, West Virginia,” Bickford told The Sporting News in 1948. Vernon Edgell Bickford was born on August 17, 1920, in Hellier, Kentucky, on the same day that Cleveland Indians shortstop Ray Chapman died after being hit by a Carl Mays pitch. Hellier is in the coalfield country of the Cumberland Mountains near the borders of Virginia and West Virginia. Known as the location of the Hatfield-McCoy feud in the 19th century, the region was growing in population when Bickford was born, having ballooned by more than 50 percent in 10 years. Bickford grew up with six siblings (Estil, Raymond, Robert, James, Inez, and Irma). His father was a coal miner in Kentucky who for a short time owned a general store in a mining district until a strike by miners put him out of business. 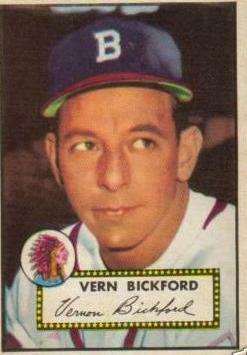 While Vern was a child, the Bickfords moved to New Canton, Virginia, 60 miles northwest of Richmond in Central Virginia, where Bickford captained the local high school baseball, football, and basketball teams. After high school, Bickford played semipro ball for a briquette plant in Berwind, West Virginia, which is where Welch Miners manager “Sad Sam” Gray, a 20-game winner in 1928 who pitched in the majors for 10 seasons, heard about the scrawny right-hander. Bickford signed with Gray’s team in 1939, and pitched in 10 games, winning five and striking out 47 in 62 innings. “I still didn’t know anything about pitching. I was a thrower -- strictly. I could throw them by the Class D boys pretty well, but that was all I was good for,” Bickford said. Bickford struggled with his control during his four years with the Welch Miners before being drafted into the Army. He started in the Air Corps, and ultimately was transferred to the infantry. The first bit of good fortune during the war years was when Bickford met his future wife, Jean Margaret Froyne, while he was stationed at March Field in Riverside, California. They married on November 4, 1944. During the early years of the war, Bickford spent little time playing baseball. It was later, while stationed in the Philippines, that he picked up the horsehide again, playing for the Leyte All-Stars and the Manila Dodgers. In Manila, he threw alongside Brooklyn Dodger Kirby Higbe and Jim Hearn, and the pitching was so strong that supposedly future Hall-of-Famer Early Wynn played shortstop. Higbe talked positively about Bickford’s ability. Bickford spent the closing days of the war developing a slider and controlling his changeup while getting pointers from major leaguers Roy Partee, Max Macon, and Al Milnar. Bickford returned to the States after the war as the property of the Boston Braves. He threw one game for Hartford in the Eastern League before joining the Jackson team in the Southeastern League. He won 10 games that year, and was third in strikeouts and tied for first in the league with four shutouts He later recalled that it was in the middle of that 1946 season that he finally gained control. The following year, he went to Indianapolis, where a coin flip brought him to the attention of Braves owner Lou Perini. The owner of the Indianapolis team, Frank McKinney (also a Braves stockholder), led a group, which included entertainer Bing Crosby, that bought the Pirates for $2.5 million. Faced with the question of who in fact owned the Indianapolis players, McKinney or Perini, Organized Baseball asked them to divide the squad. They agreed upon all but eight of the players. They held a draft for the eight in the Hotel Floridian in Miami Beach, and Perini won the first pick with the coin flip. Perini acknowledged later that he was unfamiliar with minor-league players’ names. He scanned the list of players and the name Bickford stuck out because during the war Brooklyn’s Branch Rickey tried to acquire the pitcher. He knew that if Rickey wanted Bickford, he must have been a good pitcher. Perini selected Bickford with his first choice, and sent the righty to the Braves’ farm club in Milwaukee. Bickford did not impress over the first two months in relief, but a string of doubleheaders forced the Milwaukee club to start him. He shut out St. Paul on two hits, and over two weeks he threw four complete games and allowed only one run. Recalling his year with the Milwaukee Brewers, Bickford said, “By that time, I was married and had a youngster to support. I had come to the conclusion that if I didn’t make good with Milwaukee and show myself a pretty good chance of moving up, I’d have to quit baseball and try to find something else to do for a living.” So 1947 was a turning point for Bickford. On September 5, 1947, Bickford hurled eight hitless innings against Minneapolis before giving up a single to pinch-hitter Andy Gilbert to lead off the ninth. “With his curve, speed, and his great change of pace, Bickford is definitely a fine prospect,” said Brewers president Jake Flowers. The Braves agreed and five days later they brought Bickford to Boston. Bickford achieved an American boy’s dream on May 19, 1948. Nine years after signing his first professional contract, he started for the Boston Braves against Rip Sewell and the Pittsburgh Pirates after scheduled starter Red Barrett complained of a sore throat. The 27-year-old rookie was “considered little more than a relief hurler,” according to Boston Globe reporter Clif Keane. After a rough first inning, when he loaded the bases, Bickford shut down the Pirates, 4-1, handing Sewell his first loss of the year and making Barrett look like 1948’s version of Wally Pipp. Despite fighting a sore arm, Bickford impressed not only the Braves fans; his bosses gave him a raise at the All-Star break. Bickford won 11 games in 22 starts in 1948 and none was more important than the September 26 game against the Giants before 31,172 fans at Braves Field when Bickford won a 3-2 game to secure the franchise’s first pennant since 1914. Bickford’s 11-5 record, his team-leading winning percentage of .688, and his 3.27 ERA were a big factor in the Braves’ success. Bickford started Game Three in the World Series for the Braves after his team’s top twirlers, Warren Spahn and Johnny Sain, split the first two games. After two scoreless innings, the Indians scored an unearned run off Bickford in the third. He gave up three hits and a walk in the fourth before manager Billy Southworth replaced him with Bill Voiselle. The Indians went on to a 2-0 win behind Gene Bearden. That was the end of Bickford’s year as Southworth decided to start Voiselle in Game Six, which the Indians won, 4-3, and took the Series. The difference for Bickford in 1950, according to his manager, was control. “Control is what has made Bickford better than ever before. He’s putting that ball where he wants it to go,” said Southworth despite the fact that Bickford was among the league-leaders in bases on balls for the second straight year. “I’ve worked a lot with Bob Keely, our bullpen catcher, and I’ve just kept throwing and throwing. As a result, the hitters can’t ‘take’ on me the way they used to. For the pitches are going where I want them -- for strikes,” said Bickford that year. Along with his 10 wins by the middle of July, he was leading the league with 15 complete games. After 22 games, Bickford had accumulated 169 innings. After Bickford took a ball off his elbow during batting practice, he entered his August 11 start against the Dodgers surrounded by questions. “It is a crucial spot for the Braves because two questions need quick answering. One, Bickford’s elbow, hurt last Monday by a batting practice pitch. Two, when are the Braves going to start banging out wins in bunches?” wondered the Boston Globe prior to Bickford’s start. Before more than 29,000 fans, Bickford answered the first question by no-hitting a Brooklyn Dodgers lineup that featured Jackie Robinson, Duke Snider, Roy Campanella, and Pee Wee Reese. With an assortment of curves, sliders, fastballs, and changeups, and “the precision of a master craftsman,” Bickford kept the Dodgers off-balance for his 14th win of the year. The nighttime no-hitter was saved by a defensive gem when Willard Marshall caught a fly ball in short right-center field after colliding with Sam Jethroe and Roy Hartsfield. Twirling the franchise’s seventh no-hitter, Bickford faced 30 batters and didn’t allow a runner to reach second until the ninth. In that inning, with two men on base and one out, Bickford snapped off a curve to Snider, who bounced a grounder up the middle, where Buddy Kerr grabbed the ball, stepped on second, and threw to first baseman Earl Torgeson for the double play. “All I wanted was the game. That was all. No, I didn’t think anything about it for eight innings. But, truthfully, I did in that ninth. Especially when I walked those two hitters,” Bickford said. The no-hitter gained Bickford a certain level of celebrity, but he settled down and won five more games over the next month. Stuck on 19 wins, though, Bickford failed six times to win number 20, finishing the season at 19-14 (Spahn won 21; Sain won 20). Bickford led the league with 27 complete games, 39 starts, 1,325 batters faced, and 311 2/3 innings pitched, and posted a 3.47 ERA. He even received MVP consideration, garnering four points in the balloting. Bickford spent his winter hunting, fishing, and working around the house in Virginia, and answering questions about his no-hitter. “I’ve heard some talk that maybe I gave out too much for the no-hitter. A couple of fellows, Ed Head and Rex Barney, never did much after their no-hitters. But I know I was pitching better after that big night. I’ll be satisfied to take up where I left off, not losing, of course, but with the same stuff and strength. There’s no reason I won’t,” said Bickford. Though he was the only one of the top three Braves hurlers who didn’t win 20 in 1950, Bickford got the ball for the season opener against the Giants in 1951-- the first Braves pitcher not named Spahn or Sain to get an Opening Day start since the war. The year 1951 looked bright for Spahn, Sain, and Bickford after they combined for 60 wins, but only Spahn maintained that level of mastery. The Braves lost 4-0 in the opener. On May 6, Bickford watched as Pirates pitcher Cliff Chambers no-hit the Braves. After the game, the reporters surrounded Bickford for some words of wisdom. During that same month, Bickford tangled in a classic pitchers’ duel with another no-hit club member, Ewell Blackwell of the Reds. Bickford kept the Reds to two hits, but one of them was a home run by catcher Johnny Pramesa, giving Blackwell, who allowed just one hit, a 1-0 win. After becoming the first NL pitcher to win six games by the middle of May, Bickford struggled and was injured on July 5 on the same day the Braves lost their other top righty, Sain, to injury. Bickford pulled a muscle in his right shoulder and left after the fourth inning against the Phillies. After more than two weeks off, Bickford returned and was shelled for six runs by the Pirates, but won the game 11-6 to pick up his 10th win. He followed with a handful of inconsistent starts, and then lost nearly two months after breaking his right ring finger during a game of pepper at Wrigley Field. He threw three more times in September, allowing six hits and three runs in five relief innings. Bickford said he was pleased with his performance, and explained why he wanted to return to the Braves that year. “Now I know I won’t be worrying all winter about this hand of mine,” said Bickford, who finished the year at 11-9 with a 3.12 ERA, which was eighth best in the NL. Bickford’s 1952 campaign was plagued with inconsistency, injury, and strife. At the beginning of the year, he took part in the new medium of television. With Tommy Holmes, Spahn, and Bucky Walters, Bickford was part of the Braves’ Baseball in Your Living Room on a Boston TV station, WNAC-TV, which provided baseball tips from the pros. Bickford may have wondered if television was a safer bet after starting his 1952 season. Umpires tossed him from two games within three months -- and he didn’t pitch in either. During an April 24 game against the Giants, umpire Art Gore threw out Bickford, who argued from the dugout after a hidden ball play in which Torgeson tagged Max Lanier. Gore told the Braves that he had stopped play before Torgeson tagged Lanier, which wiped out the hidden ball trick. “Some of the umpires are too complacent. They’ve got these jobs for life and they know they can’t lose them unless they break a leg. So they don’t hustle,” Bickford said after the game. Bickford was tossed out of another game on July 2 after Torgeson punched Giants catcher Sal Yvars. Bickford argued that the umpires should have ejected both Yvars and Torgeson. Bickford’s year didn’t get any better. He finished the 1952 campaign in August after a Willie Jones liner struck his pitching hand. Not realizing the extent of the injury, Bickford pitched another 2 1/3 innings before leaving the game. X-rays showed he suffered a broken middle finger. He’d finished the year 7-12 (3.74). Stormy weather continued to follow Bickford during the offseason. While hunting in Medford, Maine, he was part of a deer hunting party that ended in a fatality. Phil Page, former big league pitcher and coach, was part of the group of baseball-playing hunters. The trip ended when Page and his guide, Carlton Bragg, reportedly mistook an 18-year-old Howland, Maine, resident for a deer. They fired at the brush and fatally wounded the teen. The strange circumstances surrounding Bickford continued. Shortly before spring training, his friend Torgeson was traded to the Phillies as part of a four-team deal. Torgeson planned to fly to spring training in New Orleans, but he borrowed Bickford’s car instead. The Torgesons made it safely to New Orleans, though the plane in which he planned to fly crashed into the Gulf of Mexico, killing 46 people. Bickford followed his disappointing 1952 season with another tough year, winning only two games while pitching mostly in relief for the Braves, now relocated in Milwaukee. But it wasn’t his pitching that made news in 1953. While the nation celebrated the end of the Korean War, there was another battle brewing in New York City. Bickford and fiery teammate Johnny Logan came to blows at a Midtown Manhattan restaurant. The cause of the fight was reportedly baseball-related. “It was a case of a couple of tempers flaring up for a couple of minutes, but it was all over in a hurry. We swung a couple of punches and then shook hands…. We were both sorry…Johnny’s a good guy and we’re still friends,” said Bickford. “It was a one-punch scrap. We got into an argument over something that happened in the game. We shook hands and it’s all forgotten. We’re buddies now,” said Logan. Though Bickford called the fight a “silly little argument,” those who saw the skirmish reported otherwise. Spectators told reporters about a battle that stretched into the street. Newspapers had some fun at the players’ expense, including one Chicago sportswriter who reportedly asked Braves manager Charlie Grimm, “Is it true that the only pitcher Logan can hit is Bickford?” Grimm did not find the aftermath amusing, saying it was a “tempest in a teapot.” Bickford reported to Ebbets Field the next day with a black eye and cuts to his face. After a difficult season, the Braves granted Bickford’s trade request and dealt him to the new Baltimore Orioles for $10,000 and catcher Charles White Jr., who was with the Orioles’ San Antonio farm team. Bickford impressed during the early days of spring training, outrunning Orioles rookies in wind sprints and chasing fly balls for hours. He was hopeful for a new start. Bickford was given his only start on April 24, hurling four innings in a 14-4 loss to the White Sox. After the start, Bickford complained of elbow stiffness. He was released two weeks later. After having an elbow spur removed in the summer of 1954, Bickford gave it one more shot. He tried a comeback in 1955 with the nearby Richmond Virginians of the International League. It didn’t work out; he posted a 1-0 record but with an ERA of 8.49 over just 35 innings of work, and retired from baseball. With his baseball career behind him, Bickford spent his remaining years as a car dealer, traveling salesman, and carpenter. Still not yet 40 and with three boys at home (Michael, Kenneth, and Vernon Jr.), Bickford’s life came to a premature end on May 6, 1960, at McGuire Veterans Hospital in Richmond. From his hospital bed, Bickford, stricken with cancer and down to 120 pounds, spoke optimistically just days before his death about the future and possibly returning to baseball. “The doctors tell me I’ll walk again, and that’s just what I intend to do. I believe that because of my experience I could get a coaching job. At least, I could teach my three boys something about pitching,” said Bickford. Bickford was buried in Mount Zion Baptist Church Cemetery in Buckingham County, Virginia. The saying of “Spahn and Sain and Pray for Rain” is a popular refrain when baseball fans think back to the late-1940s Braves. But from 1948 through 1950, Vern Bickford was a strong number three hurler, accumulating 46 wins, throwing a no-hitter, and leading the league in innings pitched one year. Finding a word that rhymes with Bickford would prove a difficult task, but baseball fans should know that for those three years Bickford rivaled his more famous mound mates in the eyes of his teammates and competition.